An effluent pond in Southeast Texas was suffering from years of erosion. In 2014, an escalation of subsurface water seepage through the pond’s embankment, threatened the community’s main water source. Quail Valley is a residential community located in Missouri City, Texas. The small community is filled with ponds and flowing creeks. An effluent pond in Quail Valley was suffering from soil erosion at its east bank. Erosion control at the pond had been an ongoing struggle and concern for the Missouri City officials and the Public Works Department. The pond is part of the Quail Valley Waste Water Treatment Plant, and through wastewater reclamation, the pond is used to water nearby fairways at the city-owned Quail Valley Golf Course. Over time, the pond’s erosion issues escalated to the extent that water was traveling through the bank’s subsurface soil, entering Stafford Run Creek more than 10 feet east of the pond. Standing atop the bank, an individual could see where water was flowing from the pond to the creek. The pond was slowly draining into the creek through the east bank, while, simultaneously eroding and weakening the bank soils. If the problem continued unaddressed, the city could lose its watering source for golf course fairways and the weak bank could potentially collapse, damming Stafford Run Creek. In 2010, in an attempt to stabilize bank soils and cut-off water migration, a portion of the pond’s bank had been mud-jacked in with cementitious slurry. Unfortunately, the solution was only temporary. Bank soils continued to erode and water continued migrating into Stafford Run Creek. The pond lies within sight of golfers at Quail Valley Golf Course. In 2013 while golfing, the Missouri City mayor, Allen Owen, noticed the pond looked extremely low. He immediately notified Public Works Department employees and shortly after, the east bank actually had a major blowout due to heavy rains. It was decided that a permanent solution was needed to stop erosion and water migration. 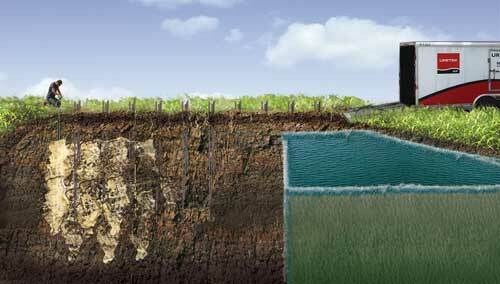 URETEK proposed an economical solution that would stop water migration and stabilize bank soils. The city awarded the contract to URETEK, due to the company’s history of success in soil stabilization repair, as well as the attractive price tag. URETEK’s plan was to create an underground curtain wall by utilizing a polymeric compaction grouting method. The underground curtain wall would span across the bank, creating a water-tight barrier, preventing future water migration, as well as, adding structural stability to weakened areas. To do this, URETEK would utilize their unique hydro-insensitive polymer that is designed to stop migrating water, cut-off potential migration routes and provide much needed structural support to the pond bank. URETEK’s patented polymer is a lightweight, high-density, structural-grade polyurethane “foam” capable of lifting and supporting multi-tonnage. URETEK’s polymer is used in a variety of repair methods, such as commercial and residential foundation repair, void filling, and manhole rehabilitation. An important characteristic to successfully stopping water migration is having a solution that has a closed-cell makeup and hydro-insensitivity. URETEK’s polymer resin has a closed-cell makeup that will allow it to expand and cure in the presence of water. It is also hydro-insensitive, meaning it will allow it to repel water and maintain structure in heavily saturated conditions. Soon after Missouri City accepted the proposal, URETEK technicians mobilized to make bank repairs. To create the underground curtain, a series of linear holes were drilled every five feet along the east and south pond bank. The holes are injection sites for the structural polymer. Starting at -20 feet, URETEK technicians began injecting structural polymer to depth, where it expands. As the structural polymer expands, it compresses loose soils, fills subsurface voids, fissures and bonds with surrounding soils. Technicians watch for visual cues like outcropping or soil movement. These signs demonstrate positive results. After injecting at -20 feet, technicians inject at -15 feet, then -10 feet and finally -5 feet. Technicians then move to an adjacent hole and repeat the injection process, creating a water-tight underground curtain one section at a time. At an especially weak section of the east bank where migrating water had heavily eroded the bank, three rows of underground curtains were created for extra reinforcement. By the end, URETEK injected structural polymer at more than 100 injection sites, successfully creating a 500 foot underground curtain along the east and south pond bank. All water migration ceased, the soils were strengthened, and the pond bank was successfully stabilized. The repairs at the pond bank allowed the city to continue using its reservoir to water golf course fairways with no further problems. 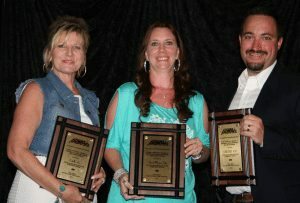 06/19/14 – Galveston, TX – URETEK’s successful efforts with the Missouri City Pond Embankment Project was recognized by the American Public Works Association’s Texas Chapter. URETEK was honored to have earned the Project of the Year Award– (less than $2 Million) at the TPWA’s 2014 Annual Conference’s Reception and Awards Banquet.